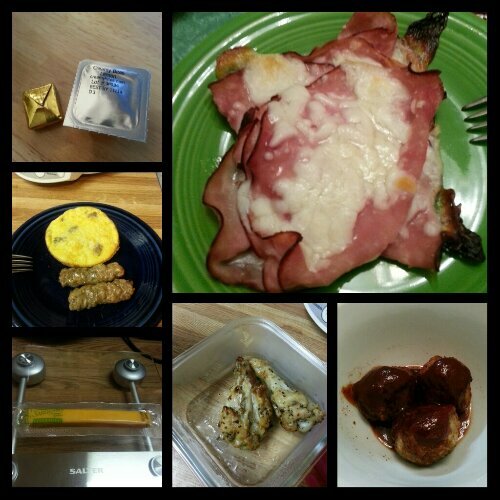 Today’s food choices, from upper right: DaBecca maple honey ham with melted mozzarella; Trader Joe’s turkey meatballs with 1 T. Rufus Teague’s Touch of Heat barbecue sauce; chipotle lime chicken drummettes; Sargento reduced fat cheese stick; mini turkey sausage omelet and Applegate Farms pork sausage links (I only ate half my omelet–I wasn’t feelin’ it this morning); calcium and multivitamin x2. I forgot to snap a photo of the green chile chicken stew I ate at lunch. One week of school down, 35 more to go! This week definitely presented its challenges, as I tried to learn to adjust to fitting my new lifestyle into my workday. I knew ahead of time it would not be easy, but I didn’t realize just how difficult it would actually be until I had to live it. I thought I’d planned ahead enough for meals–and I did! I cooked a good bit on Sunday and had portioned everything out, but I’m still getting the hang of making sure that during the week, I eat all the things I fix myself. I forgot to consider that Wednesday nights, I eat dinner at my Rotary Club meeting, so I had some extra food left in the fridge that will likely not get eaten. I’m still new at this scaling back meals thing, and I’m hopeful I’ll eventually get the hang of it. Scaling back when I cook is important, because I need to be able to make smaller quantities of food for myself since my husband is still on full liquids and is about to graduate to soft solids next week. I have no interest in going back to soft solids and am enjoying my foray into dense proteins! But if I need to make some soft solids for myself along with my husband, I will. Especially if it throws in some variety in my weekly menu. We did go to Trader Joe’s tonight and I picked up some turkey jerky, which I plan to use for snacktime in lieu of cheese, and I picked up a crab-stuffed flounder filet that I am planning to try tomorrow for lunch and dinner. I am someone who gets bored with my food, especially if I eat the same thing over and over and over. This is not a good thing, because if I don’t have some sort of variety in my food repetoire, I will seek out things that I know I should not be eating because they will slow or stall my weight loss. Even though I don’t keep those things in my house, I will find ways to seek these things out–drive-throughs, etc. I have successfully fought this urge so far, but what happens when the day comes that I don’t? This is something that I think is going to require constant, vigilant work and implementation of the coping skills I’ve acquired so far. I have discovered that now my sleeve capacity is 3 ounces of dense protein. This is both good and bad. It is good in that I can eat fewer meals during the day–great for when I’m at school and can’t always eat during class. It is bad in that I know now that I can eat a little bit more than I could before, and so I try to. I’m trying hard to undereat my capacity but it’s tough. Using MyFitnessPal, I see that I’m hitting 800 calories (where my doctor wants me to be), but I also see that some of the most successful sleeve patients eat between 600-800 calories in the weight loss phase. I fear that I won’t be successful if I get out of that range, but I also know that I risk permanently screwing up my metabolism if I don’t. It’s quite a conundrum. I mean, I’ve done pretty well so far–67 pounds gone since June is not anything to sneeze at. I’ve lost 30 of those pounds since surgery in July, so 30 pounds in 7 weeks. Not terrible when you consider the average weight loss there is a hair over 4 pounds a week. I’m just scared that the rate will slow to a crawl, like it always has before, and then when the crawl stops, the weight loss will stop completely and I will be back at Square One. This is something I definitely need to work out with myself and the part of my brain that thinks I’m on a diet. I’m not–I’ve drastically changed my anatomy and lifestyle, but I am NOT on a diet. At the very least, I need to shake that damn mentality. It just isn’t healthy at this stage of the game for me. I am still trying to acclimate to the fact that I can no longer eat in the quantities I could before, and that I can no longer eat the quality of foods I ate before. I’m also still trying to get accustomed to the fact that my surgeon took OUT 80% of my stomach. Gone. Forever. Not coming back. It’s a weird thing to finally acknowledge. All of this is finally starting to sink in, and it’s hard to handle sometimes without turning to the one thing that would have soothed my stress about all this–food. And I am a stress eater, and can’t eat. I’ve got to find other ways to deal with this. Enter exercise. I’ve been dragging my feet on exercising because quite frankly, I dislike it. I think I dislike it so much because to do it hurts. I am really uncomfortable and achy when I do it, and those are two things I don’t like to be. But I also know that without exercise my weight loss will be really, really slow and I will get discouraged. I need to exercise to tone my muscles and to improve my cardiovascular health as well. And I do like how I feel after I do it, so there is that. But, baby steps. With school starting, I increased my activity this week. Now if you saw my Fitbit activity, you might not think it was too much. But considering that before I started school this week I wasn’t even hitting 4,000 steps a day, the fact that I have hit 7,000+ steps on 3 of 5 school days this week is not bad. I have made a conscious effort to take a 15 minute walk nearly every day this week at work, which I would have never done before. This has been a really good thing for me for multiple reasons, which I talked about earlier this week. I’m going to continue to aim for 7,000 steps daily for the next month. On September 26, I’ll begin aiming for 8,000 steps daily and I’ll increase it each month by 1,000 steps daily. I am planning to participate in a “1-mile mosey” (I will likely just walk really fast) at my university’s Homecoming in November. The event is a 5K with an associated 1-mile Mosey that honors one of our alumni, who is the brother of a classmate of mine that passed away several years ago. The funds raised are funneled into a scholarship named after him. I’d planned to participate in the Mosey a couple of years ago but I chickened out. I didn’t have a good reason for it; I just really didn’t feel like I could do it. This time, I am going to go through with it. I don’t have a good excuse not to do it. And I want to honor my commitment to myself to improve my fitness and achieve one of my goals of participating in a race before the end of the year. I don’t much care if I win; I just want to finish in less than 30 minutes. The last mile race I participated in, I was heavier than I am now, and I finished in a hair under 30 minutes. When I do this race in November, I will hopefully be considerably lighter than I was at the last race I walked, and hopefully I’ll be able to shave a few minutes off my old time. One of my personal goals is to complete a 5K, running, of course. I promised myself that once I got down into the 260’s, I would start working toward learning to run again. It’s been so long since I last ran–over 20 years–that I don’t know if I could do it correctly without hurting myself even if I tried. My knees are completely shot, and I am pretty sure I wouldn’t know what to do with my arms either. I want to take the 9 to 5K class at Luke’s Locker, but I’m wondering if I should visit with a physical therapist first who specializes in sports and sports injuries so that I can see where I need to improve my muscle strength to stabilize my crunchy knees and avoid hurting myself. I hesitate to take the class in the fall/winter because I break out in hives all over when I get cold, no matter how many layers of clothes I have on my body. It’s really bizarre but it happens on the regular when I get too cold. So I may wait until the spring to take the class when it is slightly warmer outside, and focus on swimming and aqua exercise until then. But I want to complete at least one 5K before my surgery anniversary of July 8, 2014. After that, I’d love to be able to run one each month in a different location every time. When next payday comes, I plan to buy my rec center membership and enroll in some aqua aerobics classes. I just need to find some that fit into my schedule. Tomorrow, I will go to the gym for a little bit and ride the recumbent bike and do a little weight lifting. I promised myself I’d go to the gym Fridays, Saturdays and Sundays and I failed at it today, but I did get in over 7,000 steps walking today so there’s that. Tomorrow I’ll go, ride the bike and start accruing mileage toward my trip to Chicago. One step, one bite, one sip and one day at a time. I’ll master this sleeve life yet. This entry was posted in challenges, choices, daily bites, exercise, goals, vsg, weight loss surgery and tagged 9 to 5K, challenges, daily bites, exercise, Jameson 5K, Luke's Locker, post-op eating, post-op life, the sleeve, VSG, vsg and work, vsg realness, werk!, WLS, work that head game, workin' on my fitness. Bookmark the permalink. I love that you’re “biking” to Chicago … I started doing something similar awhile ago, using both my stationary bike and my outside bike. I got a book of American road trips, and decided to start with the Route 66 one. It lists sights to see along the way, so I made a list of the sights and googled/mapquested directions for each segment. (They actually have directions for biking!) I have a US map hanging on my wall with the route penciled in. The part I’ve already “ridden” is gone over in a red Sharpie and there are three pushpins on it – one where I “started”, one on the Santa Monica Pier at the end, and one showing where I’m at right now. I put pretty beads in a special glass my aunt gave me, and when it gets near to full, I dump it out, count up the beads/miles, and see how far it gets me on the directions. Then I actually go on-line to Google maps and “bike” my trip using the “ground level” feature (I think it’s actually called 3-D or something like that). Currently I’m somewhere in Oklahoma, about to make it into Texas. My aunt has requested that I “bike” from Florida to upstate New York next. Part of me wants to actually do it, but with two cats and a dog at home, I don’t think that’ll happen any time soon.